Although there are plenty of alternative cancer treatments out there, there is very little evidence that any of them actually work. Such ‘miracle cures’ offer false hope, undermine confidence in effective medicine and can be dangerous and expensive. 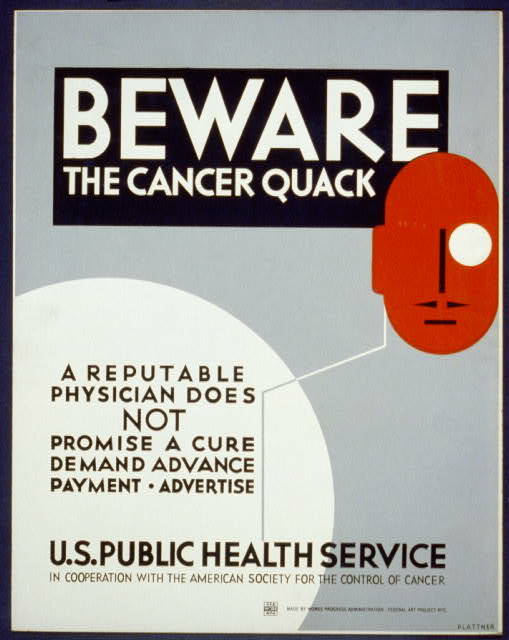 The Cancer Act (1939) effectively makes it illegal to advertise such products. There have been over twenty cases since 1984, with three successful prosecutions in 2014 alone. Many other therapists and companies have had to amend or remove advertising after being contacted by Trading Standards under the Cancer Act. If you come across any advertisements which you feel could be in breach of the Cancer Act, please let us know. If we agree, we will either take action on your behalf, or we can support you in reporting the advertisement to Trading Standards. 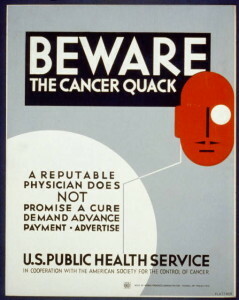 It is important to note that within the context or the Cancer Act, “advertisement” includes “any notice, circular, label, wrapper or other document, and any announcement made orally or by any means of producing or transmitting sounds”. This means that some events could be covered by the Act. For example, the Totnes Cancer Conference lost their venue after MP Dr Sarah Wollaston raised concerns with Trading Standards. However, the Cancer Act should not prevent people from simply providing information. A conference would only be covered if someone involved was marketing a treatment in some way. selling a product claimed to treat cancer? promoting a product claimed to treat cancer? representing an organisation which sells products or treatments for cancer? If you can answer “yes” to any of these, please contact me, laura@goodthinkingsociety.org, giving details of where and when you saw the ad and what action has already been taken, if any.